The following cases were heard under the Aroostook Criminal Docket at the Houlton Courthouse during the month of March. 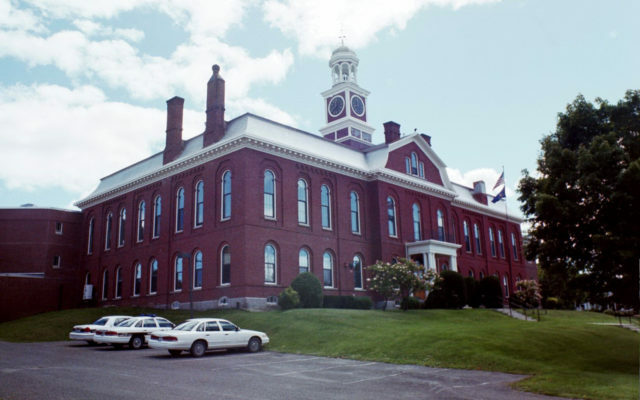 HOULTON, Maine — The following cases were heard under the Aroostook Criminal Docket at the Houlton Courthouse during the month of March. Dushko V. Vulchev, 41, Houlton: probation violation, 80 days in jail, probation partially revoked. Todd Burdick, 47, Sherman: operating meth laboratory, three years in prison all but six months suspended, two years’ probation. Wade A. Frye, 37, Houlton: unlawful possession of scheduled drug, $1,000 fine. Justin M. Corson, 30, Houlton: theft by unauthorized taking or transfer, $500 fine, 48 hours in jail. Ashley Quint, 32, Houlton: theft by unauthorized taking or transfer, priors, three years in prison all suspended, one year probation, $4,344.89 restitution. Jason Tapley, 35, Houlton: violating protection from abuse order, 30 days in jail. Donald W. Flanders, 58, Houlton: unlawful trafficking in scheduled drugs, $400 fine, three years in prison all but six months suspended, two years’ probation. Brady Bridges, 47, Houlton: theft by extortion, 24 months in prison. Benjamin M. Ireland, 22, Houlton: probation violation, 60 days in jail, probation partially revoked. Randy T. Folsom, 29, Houlton: disorderly conduct, offensive words, gestures, $250 fine. Cathy Smith, 66, Bridgewater: violation of privacy, filed on $500 costs. Derek A. Doughty, 27, Hodgdon: obstructing report of crime, 60 days in jail; domestic violence criminal threatening, priors DV, 24 months in prison all but 60 days suspended, two years’ probation; domestic violence assault, 60 days in jail. Logan A. Grant, 21, Houlton: unlawful trafficking in scheduled drugs, $400 fine, three years in prison all but six months suspended, three years’ probation, $120 restitution. Anthony Thorne, 55, Houlton: domestic violence assault, four years in prison all but nine months one day suspended, two years’ probation; criminal mischief, 30 days in jail. Nathan Owen Nash, 39, Houlton: aggravated assault, three years in prison. Ronald Lycette, 58, Amity: violating condition of release, 48 hours in jail. Brittany Long, 29, Glenburn: criminal trespass, 48 hours in jail. Joshua J. Branscombe, 28, Oakfield: unlawful trafficking in scheduled drugs, $1,000 fine, three years in prison all but nine months one day suspended, two years’ probation, $240 restitution. Nathan Owen Nash, 39, Houlton: violating condition of release, six months in jail; violating condition of release, 30 days in jail. Brandon Ryan, 34, Houlton: OUI (alcohol), $500 fine, 150-day license suspension. Ryan Cottle, 33, Houlton: OUI (drugs or combo), $500 fine, 48 hours in jail, 150-day license suspension; violating condition of release, 48 hours in jail. Christopher Saunders, 29, Caribou: unlawful possession of scheduled drug, $400 fine, seven days in jail. Darrell K. Robertson, Jr., 59, domestic violence assault, $500 fine. Michael T. Pelham, 53, Oakfield: OUI (alcohol), $500 fine, seven days in jail, 150-day license suspension; refusing to sign uniform summons complaint, 48 hours in jail. Paula Flewelling, 57, Monticello: operating vehicle without license, $150 fine. Clinton J. Michaud, 29, Crystal: violating protection from abuse order, seven days in jail; operating while license suspended or revoked, prior, $500 fine. Bayleigh Voisine, 28, Presque Isle: theft by unauthorized taking or transfer, $200 fine, $16.16 restitution; violating condition of release, $200 fine. Thomas Wells, 43, Old Orchard Beach: assault, $300 fine. Mark Douglas Drake, 34, Houlton: probation violation, 30 days in jail, probation partially revoked. Bayleigh Voisine, 28, Presque Isle: unlawful possession of scheduled drug, $400 fine, two days in jail; violating condition of release, two days in jail. Brittany Long, 29, Glenburn: theft by unauthorized taking or transfer, priors, 12 months in jail all but seven days suspended, one-year probation. Michael T. Pelham, 53, Oakfield: violating condition of release, 48 hours in jail. John Rodney Drew, 35, Ashland: probation violation, 30 days in jail, probation partially revoked. Daniel J. Corey, 57, Monticello: loaded firearm or crossbow in motor vehicle, $500 fine. Joel A. Redman, 24, Island Falls: disorderly conduct, fighting, $100 fine. Lee J. Brooker, 50, Monticello: illegal possession of firearm, $1,000 fine. Andrew Ashton, 28, Littleton: obstructing report of crime, 47 days in jail; domestic violence assault, 346 days in jail all but 47 days suspended, two years’ probation; criminal mischief, 47 days in jail. Javier Enricqui Valqui, 19, Houlton: operating while license suspended or revoked-OUI, $600 fine, seven days in jail, one-year license suspension. Larry W. Carll, 40, Monticello: unlawful possession of methamphetamine, priors, $400 fine, 60 days in jail. Gilbert G. Chaloux, 59, Hodgdon: hunting under the influence over 21, $700 fine; shoot from motor vehicle, $200 fine. David L. Stevens, 69, Ludlow: hunting antlerless deer without permit, $1,000 fine, $500 restitution. Raven S. Patterson-Nighthare, 30, Linneus: theft by unauthorized taking or transfer, $200 fine, $46.85 restitution. Danny J. Merritt, 57, Molunkus: using light, snare, trap or set gun to hunt, $500 fine, 48 hours in jail. David E. Churchill, 34, Newburgh: operating while license suspended or revoked, prior, $500 fine. Andrew Ashton, 28, Littleton: violating condition of release, 47 days in jail. Alan M. Gillotti, Jr., 32, Oakfield: aggravated assault, three years 6 months in prison. Eric Dwyer, 34, Houlton: operating snowmobile under influence over 21, $600 fine. Ronald B. Dupont, 50, Linneus: operating after registration suspended, $100 fine. Peter J. McGary, 48, Hodgdon: operating while license suspended or revoked, prior, $500 fine. Patrick D. McNeil, 47, Ashland: theft by unauthorized taking or transfer, $200 fine. Philpot & Sons Trucking, Mayking, KY: operating after registration suspended, $150 fine. Todd Burdick, 47, Sherman: violating condition of release, 48 hours in jail. Joshua W. Gilman, 30, Danforth: attaching false plates, $100 fine. Jamie D. Burtt, 36, Monticello: operating vehicle without license, $100 fine. Cooper W. Blake, 32, Houlton: fishing without valid license, $100 fine. Alexis B. Hernandez, 19, Houlton: theft by unauthorized taking or transfer, $200 fine. Nathan A. Sanford, 30, Ludlow: fishing without valid license, $100 fine. Kallie R. Lynds, 43, Monticello: displaying fictitious vehicle certificate, $250 fine. Barry Ivey, 54, Ludlow: failure to register vehicle, $100 fine. Tara Lynn Walton, 50, Houlton: harassment by telephone, 72 hours in jail. Edmund Waldron, 78, Reed Plt. : unlawful possession wild animal or bird, $300 fine. Jacob K. Taylor, 28, Houlton: operating vehicle without license, $150 fine. Jason Shumaker, 29, Patten: theft by unauthorized taking or transfer, $200 fine, $36.55 restitution. Eric S. Larrabee, 35, Hodgdon: possessing fish in violation, $120 fine. Jennifer Jones, 31, Bridgeport, CT: violating condition of release, 48 hours in jail; unlawful possession of scheduled drug, $400 fine. Marcus A. Toner, 29, Houlton: operating vehicle without license, filed on $150 costs. Joseph P. Polchies, 39, Houlton: attaching false plates, $100 fine; operating vehicle without license, $150 fine. David J. Goodall, 34, Houlton: failure to register vehicle, $100 fine. Teresa Moore, 33, Houlton: harassment, three days in jail; disorderly conduct, loud unreasonable noise, three days in jail. Anthony Thorne, 55, Houlton: operating after habitual offender revocation, prior, $1,000 fine, six months in jail; violating condition of release, 30 days in jail; theft by unauthorized taking or transfer, 30 days in jail. Shelby Suitter, 21, Houlton: violating condition of release, 48 hours in jail; unlawful possession of scheduled drug, $400 fine. Nicholas Folsom, 19, Houlton: minor possessing liquor, $200 fine. Orlando Valle, Jr., 38, Hammond Twp. : cruelty to animals, $500 fine; keeping unlicensed dog, $500 fine. Jaclyn M. Valle, 39, Hammond Twp. : cruelty to animals, $500 fine. Adrienne P. McCordic, 44, Houlton: habitually truant student, $200 fine. Richard F. Mayberry, Jr., 41, Linneus: operating unregistered snowmobile, $200 fine. Kenneth R. Eastham, 55, Bangor: operating unregistered snowmobile, $200 fine. John Stanley, 26, East Machias: operating unregistered snowmobile, $200 fine. Robert G. Kinney, Jr., 31, Island Falls: operating unregistered snowmobile, $200 fine. Anthony P. Verville, 28, Hodgdon: operating vehicle on snowmobile trail, $100 fine. Peter Leuvelink, 57, Westport, MA: littering, $100 fine. Rodney P. Lane, 22, Bangor: operating unregistered snowmobile, $200 fine. Daniel J. Swallow, 23, Mars Hill: operating unregistered snowmobile, $200 fine. Gilbert Matthew Roy, 31, Houlton: allowing dog to be at large, $50 fine. Peter A. Austin, 42, Monticello: allowing minor to operate in violation of chapter, $100 fine. Benjamin A. Suitter, 34, Monticello: allowing minor to operate in violation of chapter, $100 fine. Wade L. Hanson, 49, Houlton: allowing dog to be at large, $50 fine. Megan Fitzpatrick, 24, Houlton: littering, $200 fine. Josiah Nash, 30, Monticello: allowing dog to be at large, $50 fine. Nicole Forman, 36, Monticello: allowing dog to be large, $50 fine. Aaron Eastman, 24, Littleton: operating unregistered snowmobile, $200 fine. Daniel L. Turner, 70, Littleton: ice fishing with more than five lines, $100 fine. Christopher J. Anderson, 25, Monticello: operating snowmobile on public way, $100 fine.